04 | October | 2010 | What's Cooking at the Genua's? Key Lime Pie is my favorite pie. But I could do without all the extra calories in it. This recipe is lower in calories and fat but still tastes great. If you don’t care about your calories/fat use the regular versions of the ingredients. 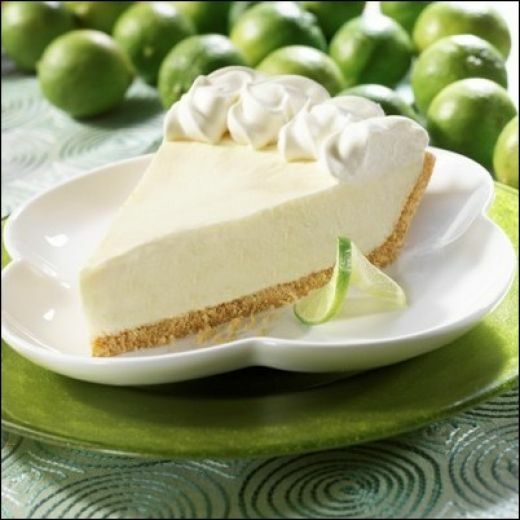 Key Lime Pie also should NOT be bright lime green in color! It should be an almost pale yellow to very faint green. All those other pies that glow in the dark have food coloring added. You don’t need it! Honest! This recipe is also very easy to make and takes more time to chill and set than it does to prepare and bake. If you are ever in Key West though, try their frozen chocolate covered key lime pie on a stick! OMG! Talk about sugar coma! But it is so incredibly delicious and heavenly. The last time I had it I shared it with my husband and stepson and we had a hard time finishing it. So worth the extra calories and fat every so often! 2. Beat eggs and egg whites at medium speed on an electric mixer until well-blended. 3. Gradually add the lime juice, zest and condensed milk into the egg mixture, beating until well-blended. 5. Cool on a wire rack. Cover loosely and chill for at least 4 hours. Spread whipped topping evenly over filling. Serve!